Wrinkles should merely indicate where the smiles have been. –Following the Equator, 1897, vol. 2, ch. 16. It’s better to keep your mouths shut and appear stupid than to open it and remove all doubt. – Attributed to Mark Twain and to Abraham Lincoln. Of the above six, my favorite on is highlighted in blue, talking about ambitions. I think in the world that we live in today, we are constantly told that we are not good enough, and that can have a huge effect on many people. This quote made me connect back to another idea or musing that I recently heard, and that is...we should only surround ourselves by people who are going to life us higher. I firmly believe in this idea, primarily because insecurities and doubts can have detrimental effects on a person, and when your own ideas and goals are put down, even further problems can develop. I believe it is extremely important and valuable to surround yourself with people who are only going to have a positive effect on you, not people who bring you down and degrade your goals and aspitations. After all, as it has been said, you become like the 5 people you hang around the most. That, too, is a strong statement. With that, I will be making a firm effort to only say positive things about others, and only say something that will lift someone up, not bring them down. On Thursday, I met up with Nasser over a nice cup of warm coffee. We were able to catch up on our weeks and talk about finals and all of our piles of homework. It was a cold day, and Nasser was wrapped up in a big 'ol winter coat, telling me how much he loves the cold. I think he's crazy, I am so ready for the warm weather! Nasser was telling me about all of the compilations involved in him flying back home to Saudi Arabia and then to Europe; there is a lot of paper work and visa information to deal with! This weekend he was planning on driving to Houston in order to go the National Embassy (if he explained that right?) to get all of his visa paperwork in order. Nasser asked me where he could get a passport photo taken, to use for his visa. I told him to go to CVS or Walgreens and they can do it for a very low price! He was so confused! "Why would you get a passport photo taken at a Pharmacy?" Valid point... but I tried to explain to him that a CVS or Walgreens serves the purpose of a convenience store, in a way. I suppose I had never really considered that they originally served the purpose of a pharmacy, and yet you can buy basically anything you need there, quick. Nasser made another valid point, that I had also never considered. If a pharmacy is intended to help people get better from either a sickness, cold, etc., then why would they sell cigarettes and beer and wine? Isn't that counterintuitive. Yes..yes, it is. But hey, it's the American way? I really didn't know how to justify it, primarily because I had never really thought about it in that way. As Nasser and I wrapped up our semester of numerous conversations, he told me how much he enjoyed talking to an American and getting to know more about my culture through our conversations. I told him how I, too, enjoyed our conversations and that they really opened my eyes to some of the not-so-normal traditions and routines that we as Americans deem normal. These conversations served as a catalyst to new ways of thinking and viewing my own lifestyle, in addition to the exposure of humor I have obtained in the class. While Nasser and I discussed each of our own countries culture and traditions, I not only became more exposed to the culture of Saudi Arabia, but I came to find a new sense of pride and love for my own country and its culture, despite how odd some of them may be. As we parted ways, Nasser took one more step towards being closer to his journey back to home, and I took one more step towards a greater understanding of myself, my own culture, and my country. Last week, I was able to meet with Nasser and catch up on our busy weeks...sorry this blog is a bit delayed! Nasser is very ready to get out of Texas and move on to the next chapter in his life. He explained to me that he is lacking any sort of motivation and is ready for the summer, to travel around Europe with his family. Ha, I'm jealous! Nasser told me that, despite his lack of enjoyment in America, that we are much nicer and much more pleasant to be around than Europeans. I guess thats one positive that Nasser has found here in America. Nasser has had a busy week with his cousin visiting that you could tell he was very distracted during our conversation... he was probably ready to get out of there and go have some fun. Nasser again had brought some of his philosophy books with him and he told me how much more he enjoyed reading those types of books, in English, than the ones he is required to read in his TCU English classes. I understand that.. we all do have our own preferences, and that is nothing to be embarrassed or ashamed of. Nasser and I talked about college sports, and he explained how he wasn't quite interested. He said football was a boring sport...WHAT! Don't sat that to a TCU football fan! He said most of the American sports were not exciting to him and that he did not understand why we, as Americans, invest so much and get so excited over a simple game. I tried to explained to him that this was part of the American culture and that it is something we greatly enjoy. Coming together to watch our TCU Horned Frogs play football is one of the greatest southern traditions to take part in, but I suppose it is something that only an American football fan can really understand. Nasser told me that at home, they fully support horse races and that is one large part of their sporting culture. He explained to me the scoring system, and even how people cheat, ha! But it was very interesting for me to hear about the contrasting differences in each country's sporting cultures. Nasser had to cut our meeting short this week because he needed to spend time with his cousin, so I completely understood. It was great to catch up, and we planned to meet next week, for our final meeting. Today I was able to meet with Nasser to catch up on our Easter weekends and everything going on with school. We talked awhile about my trip back home to Albuquerque, and he was interested to hear all the details about my hometown. And I of course, was eager to tell him! I told him about my family Easter traditions, like Hot Crossed-Buns on Easter morning. Always a treat! As we continued to talk, Nasser asked me about scholarships. I thought it was a peculiar topic, but we launched right into it. He told me that one of his friends had gotten a scholarship just because he was from a wealthy family in Africa, and he was very puzzled by this. He struggled to understand the concept of scholarships, and why anyone would just give someone such a large chunk of money to go to school. I found it interesting that he asked me such a question, for I never really thought about the concept in depth. as I explained that a lot of scholarship money comes from alumni or donors, I think he was able to understand. I told him that the hard work that some students did in high school paid off for them in college, allowing their to tuition to be taken care of. Additionally, Nasser was confused by the concept of donating back to the school; why would you give money for something you're not buying? Yes, I get the point, but I explained that is was a way of showing support for the school, etc. It amazes me how small concepts like donations and scholarships are topic that are not universal. It has been a great experience to talk with Nasser and get a better understanding of his culture, and even of my own. Nasser's cousin is visiting him for the next few weeks and Nasser seemed very excited to show him around and give him a taste of what American and Texas is really like. Perhaps his cousin will enjoy the Texas lifestyle for than Nasser. Nasser is still very excited to begin his new chapter of life at university in London next year. I must admit, I am a little jealous! But when he asks me why I love TCU and living in Texas, I could go on and on for hours, so I think I made the right choice. Lastly, we talked about the weather, because today was such a chilly day! Or at least I thought so. It was drizzling a little bit and there was crisp breeze in the air. I told Nasser I was ready for it to warm up so we could enjoy activities outside, but Nasser said he much more enjoys the cool weather, for he absolutely hates it when it gets too hot! If we think Texas summer weather is tough, think about Saudi Arabia summer weather! In response to the extra credit assignment about how to make out the meaning of life from items purchased from a souvenir shop, I took advantage of my weekend traveling through the airport to find some items. I ran into a bit of trouble with this assignment, so I had to improvise with pictures, but I am still able to portray the same message. While I was in the airport looking for items to help me "find the meaning of life," I rummaged through the mass amounts of collectors items in the Albuquerque Sunport (airport) looking for interesting items. Once I found an item that I felt "defined life"for me, I arranged the objects to take a picture (running low on cash! HA) and immediately the airport security swarmed around me. Apparently there is a no picture rule in the Albuquerque airport.....? Whoops! But hey, that's okay! I was able to remember what objects I selected and downloaded images to use so that I could describe my objects clearly. The ristra serves as a firm definition of home to me. Since I am from New Mexico, this is a object that is seen all over the state. In fact, we have about three in our house. Since chili, red or green, is such a dominant aspect of our food and culture, we hang ristras throughout our house. The formation of the chilies is to preserve them to consume later, but nowadays they are mostly used for decoration. When I see a ristra, or even just a picture of one, it instantly reminds me of home and my upbringing, which I believe helps define the meaning of life to me. The kokopelli is an image seen all around New Mexico, whether you travel to Indian ruins, or on the walls of the best mexican diner in Albuquerque. 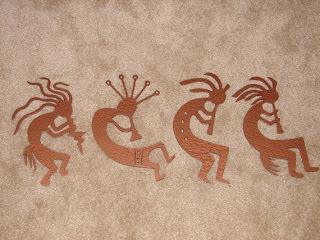 The kokopelli serves as a fertility diety, and is a widely used Native American symbol. With such a large dominance in New Mexican culture, it is an image to me that is easily recognizable. When I travel away from home and see the symbol of the kokopelli, I am quickly reminded of my family adventures to the Indian ruins, or the taste of the fluffy sopapilla at my favorite restaurant. Not only is turquoise a gorgeous color in itself, the jewelry created by the artists at the Indian Market in Santa Fe is phenonmenal. The impeccable work of the Indian artists is another great definition of home to me. 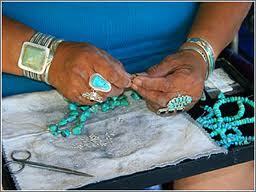 Turquoise can be seen all over the state of New Mexico and is used in many home furnishing, decorations, and jewelry. Despite my rule breaking tendencies at the airport, I hope this blog served its purpose in describing my objects that I would define life with from a giftshop. These objects serve as a strong resemblance of home and the welcoming feeling of my family. It is often difficult to be away from home for long periods of time, but little reminders like turqoiuse or a chili ristra help me remember my childhood and family memories. Although I struggled to allow myself to eavesdrop in public places and listen to what induces laughter, I let my guard down and listened in on some conversations. I paid extra attention to what induced the most laughter and found there are many more catalysts other than just a joke or humorous situation. While sitting in the airport on my heading home to Albuquerque for Easter break, I realized that people these days (maybe just grumpy travelers) complain, a lot. I was listening intently to all the people I came near to hear what they were laughing about. No one was laughing! It was compliant after complaint, grumble grumble. I understand traveling can often be a tiring and frustrating process, but c'mon, laugher makes everything better! I found it rather disappointing and sad that it took so much effort for me to hear a conversation that included laughter; laughter is the best medicine, right? While sitting in the airport, it is only obvious that you will witness a traveller sprinting through the terminal, or a heated complaint at the traveller's desk about a late flight, or missing a connecting flight. An airport really is one of the best spots to eavesdrop and people watch...humans are very peculiar beings, especially when under a bit of stress. One of the main catalysts of laughter I recognized while sitting in the airport was the entertainment people found in others' travel frustrations. When a person would be sprinting through the terminal, the cackling would begin and subtle comments like, "run" or "run little man, run!" would echo through my gate. Yes, I agree, it was funny. And I may have even made some small comments in my head... seeing some sprinting with a backpack on, bobbing up and down, while stringing along a rolling suitcase that is running over other's toes is quite a hilarious picture. But hey, I guess we have all been there a time or two. While I was sitting at my gate, there was one plane ahead of me, waiting one one woman, attempting to take off in time. The lady felt the need to stop in at the restroom on the way to her gate while she was already 15 minutes late, and the WHOLE plane was waiting for her. When people sitting at the gate realized that the whole plane was waiting for just one woman, the chuckles and comments began. It almost seemed as if this type of laughter was rooted from disgust or shock at how ignorant the woman was. The flight attendants, especially, made numerous comments and laughed over the whole situation once the plane was finally cleared for departure. It was rather shocking how some people don't recognize the importance of timeliness or courtesy to others, and this realization spurred on much laughter for everyone sitting at my gate. I believe the root of laughter can truly come from anywhere. We find humor in situations that are funny, and often situations that are overly frustrating or ridiculous. Laughter not only is a response to humor and funny situations, but serves as a relief from frustration and anger. Laughter also serves as a response of disgust or shock: how can that be happening? The situation or location in which you eavesdrop or observe laughter can play a large role in what truly induces laughter; the same themes may run through the humorous situations, such as relief, funny situations, disgust, frustration, or shock. For instance, if I had been observing people at a zoo, much laughter would have come from the silly actions of the animals, or the horrendous smell the elephants put off! We as humans have a knack for finding the ironic or humorous moments in our daily lives. After spending a lot of time laughing with my family this Easter weekend, I have been much more attentive to what makes people laugh. This weekend, much laughter came from happiness and the enjoyment of family traditions.